Posters proclaiming “Bienvenido” and Puerto Rican flags blanketed Division Street. A group played bomba music from a flag-festooned float. Dozens of students from a school Lopez helped found decades ago lined a walkway leading to La Casita de Don Pedro, a replica of a Puerto Rican home where supporters have hosted former Puerto Rican prisoners for years. Many in the crowd consider Lopez a hero of the Puerto Rican independence movement and had waited decades for this moment. Loud cheers broke out when Lopez walked through the crowd to the casita’s front porch, flanked by politicians and fellow activists. “After 35 years and months as a prisoner, I want you to know I never, ever lost hope that I’d be here with you on Division Street in Humboldt Park,” Lopez, 74, told the gathering, speaking in Spanish. Lopez was considered a top leader of the Armed Forces of National Liberation, or FALN, an ultranationalist Puerto Rican group that claimed responsibility for more than 100 bombings at government buildings, department stores, banks and restaurants in New York, Chicago, Washington and Puerto Rico during the 1970s and early ’80s. “This is our brother, our friend, family,” Torres said, a cigar in his hand. 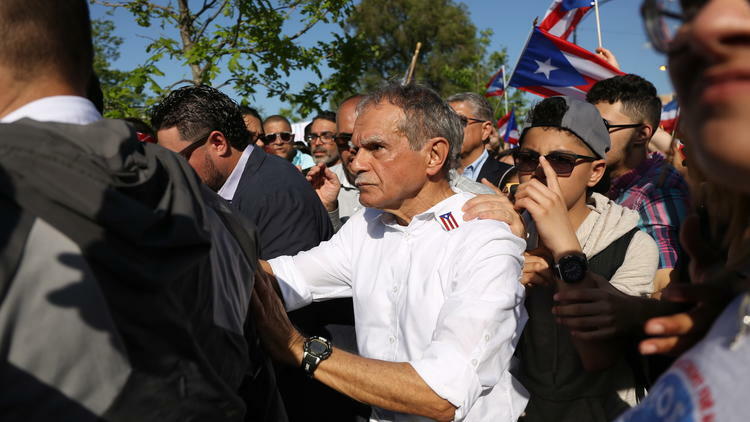 A large crowd gathered in Humboldt Park on May 18, 2017, to welcome home Puerto Rican nationalist and leader of FALN, Oscar Lopez Rivera, newly free after more than three decades in prison. President Barack Obama commuted Lopez’s 70-year prison term in January, clearing the way for his early release. Lopez, a Vietnam War veteran who moved from Puerto Rico to Chicago as a child, wasn’t convicted of having a role in the FALN bombings, which killed six people and injured dozens, but those who lost loved ones hold him responsible. “This guy was convicted of leading the FALN that murdered people,” Joseph Connor, whose father, Frank, was among four people killed in a 1975 bombing of the Fraunces Tavern in New York, told the Associated Press. The commutation ultimately granted by Obama had long been sought by pop culture figures, religious leaders and politicians who called Lopez a political prisoner. Among those supporting Lopez’s release were former President Jimmy Carter, Pope Francis and U.S. Rep. Luis Gutierrez of Chicago, former South African Archbishop Desmond Tutu and “Hamilton” creator Lin-Manuel Miranda. Back then, the area was littered with rundown buildings and plagued by unemployment. There were few thriving Puerto Rican businesses, and the education system wasn’t serving the neighborhood well. “Literally the community was burning around us,” Gutierrez said. “Many of the things we celebrate today in our neighborhood, institutionally, began with him,” Gutierrez said, citing Dr. Pedro Albizu Campos Puerto Rican High School and the Puerto Rican Cultural Center, both of which Lopez helped start. Danette Sokacich, principal at Campos high school, said Lopez’s example is one she touts to her students, dozens of whom turned out for his return. “Oscar has a relentless spirit we try to invoke in our students,” Sokacich said. Maylene Rivera, 17, said that despite his long absence Lopez is “part of the community” and said she was proud to be at his homecoming. “If it wasn’t for this school, I would’ve dropped out,” Rivera said. Lopez’s younger brother, Jose Lopez, is executive director of the cultural center. He said the neighborhood was “literally a slum and a ghetto where people lived in an extremely marginalized environment” when Oscar left for the Vietnam war. Lopez also organized against employment discrimination and pushed for Latinos to have better job opportunities. Lopez was active in “just about every facet” of “the fight for social, economic, (and) political justice,” Gutierrez said, noting he met Lopez while teaching at what is now Campos high school. “He passionately fought for the rights of Latino and black Chicagoans,” Maldonado said. Some men attempted to take it from him but, when they weren’t successful, others maneuvered their Puerto Rican flags in front of his banner, largely obscuring it from view. After the ceremony, Heller criticized Lopez.